BVU's Blog will keep you current with advice about nonprofit boards, news about volunteering, strategies for corporate community involvement, and tips for managing your nonprofit more effectively. 1. Can clearly identify its work and its role for a particular nonprofit at any point in time. 2. Is comprised of people who bring the relevant skills, expertise, diversity, networks and passion to get the job done. 3. Doesn’t just happen. It requires a tremendous amount of attention, creativity, strategy and patience. Through our work with hundreds of nonprofit boards each year, we see that the strongest boards continue to develop and evolve good governance practices in order to provide relevant leadership. Focus on the best way to achieve the mission. A crisis nursery developed a strategic plan that included a significant expansion project to serve more children and keep more families together. The success of the plan was dependent on using the strong marketing and business background of the CEO together with the board, whose duties were to expand networks and visibility of the organization in the broader community. The board also provided sound oversight for the growing programs and finances. Concentrate on the larger opportunities and challenges facing the organization, and allow staff to manage the day to day operations. A board identified and pursued potential strategic partners to ensure that their mission was preserved; they formed a strategic alliance with a similar organization, and eventually they merged. Board members with the relevant skills and expertise led this process and ensured their good work continued. Understand the relationship between board and staff, and the significance of a positive and healthy partnership. Establish structures and practices to work effectively together. Monthly communications from the chief executive to board members, annual individual meetings to help board members identify new ways to engage with the organization, constructive and thoughtful annual performance reviews, and open and transparent communications to build a culture of trust. Plan for the board’s future. The board develops annual succession plans and is always grooming future leaders. Future leaders serve as committee chairs so that they can demonstrate their leadership to the board and staff, learn more about an important aspect of the organization, and determine if they have the time and/or interest to move into leadership. Build committee structures that utilize board and staff time effectively. Meaningful work is accomplished in strong working committees. Strong working committees have an effective committee chair, strong staff support, annual calendar of meeting dates, annual priorities, and relevant agendas and publish minutes for the full board to view. Strong committees are comprised of people who bring relevant experience, expertise, networks and diversity to the work of the committee. Ensure that there is a viable business model and financial systems in place. If this is not already in place, consider engaging a pro bono consultant. BVU engaged a pro bono consultant to help a local nonprofit, and the consultant restructured all financial systems and reports, and developed a business model to sustain the organization’s diverse programs. The pro bono consultant worked closely with the chief executive and the board, and eventually joined the board. This project gave the nonprofit the ability to attract larger grants and sustain programs that meet the needs in the community. Prepare carefully for board and committee meetings. Agendas and materials go out 4-7 days in advance. 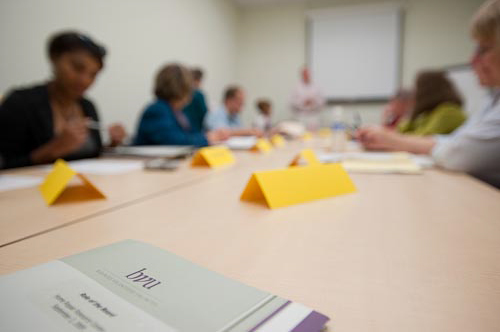 Board meetings do not consist exclusively of presentations by committee chairs or staff, but instead are used to engage board members in meaningful discussions around topics that are relevant to the mission and vision. Board members leave these meetings feeling informed, engaged, and confident that they are vital contributors to the future of the organization. Regard each board seat as precious. Written board member expectations are clear to all current and future board members. Board members are held accountable to those expectations annually. Board member terms are not renewed automatically, but considered carefully based on the changing needs of the organization and interests of the board member. There is no magic bullet or “one size fits all” solution for stronger boards. BVU’s work with nonprofits over the years has given us great insight into effective practices and policies that can help strengthen an organization. Strong boards take work, but by staying focused on your mission, the work of your board, and ensuring that you have the right board members sitting around the table, your nonprofit can position itself to navigate today’s challenges and leverage future opportunities. This entry was posted in Nonprofit Boards, Nonprofit Management and tagged Board of directors, Governance, nonprofit, nonprofit boards, Nonprofit organization, Strong Board on March 13, 2014 by BVU: The Center for Nonprofit Excellence. BVU: The Center for Nonprofit Excellence is a national model organization that strengthens nonprofits by involving thousands of volunteers from the community; engaging hundreds of business executives and professionals on nonprofit boards of directors; and providing leading-edge board and management consulting and training services for nonprofits.